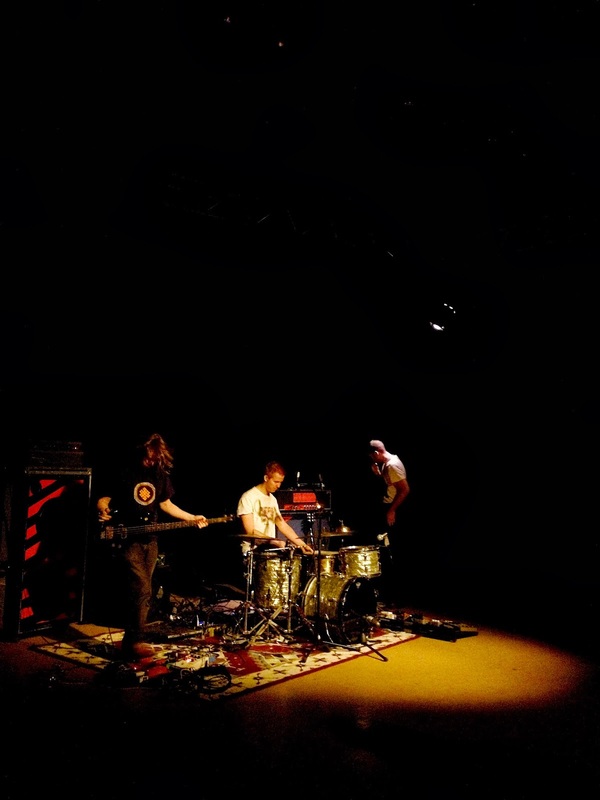 After a beer or two its time for the main event, the Noiserock trio Staer from Norway. The band has positioned themselves on the floor. Im not sure but Ive always felt a bit annoyed when people set up flat on the floor but with Staer its a blessing. It feels like a privilege to be close to see what is going on. The trio is placed with drummer Thore Warland firmly placed in the centre. As some of you might know Im originally a percussionist. Thats were I started and I always look for new and interesting drummers or percussionists. I like everyone from Ringo to Aphex Twin to Tom Waits and Harry Partch and back again. So when we were about to start up my old band Änglagård again I started to look around to see what was going on on the drumming scene. I wanted to do my homework, find out what was going on...and I must say I wasnt really too impressed. This is sort of what I found or things quite like it. Hours and hours of practise. And to me it sort of actually feels like this. There are amazing drummers out there but when I listen to them all I hear are chops, math and endless hours of practising but sadly enough....almost no Ideas or visions. No personality. To me Bill Bruford, Stewart Copeland and Jaki Liebzeit are still people I admire and look up to as their feel is so personal and strong. The superdrummers nowadays that are perceived as being great are of course very impressive. But their drumming never moves me, it leaves me cold. Staers drummer is very much the opposite. He has chops but his ideas and approach are filled with personality and a very unique dialect. His way of moving around a kit is inspiring and his body language speaks volumes. 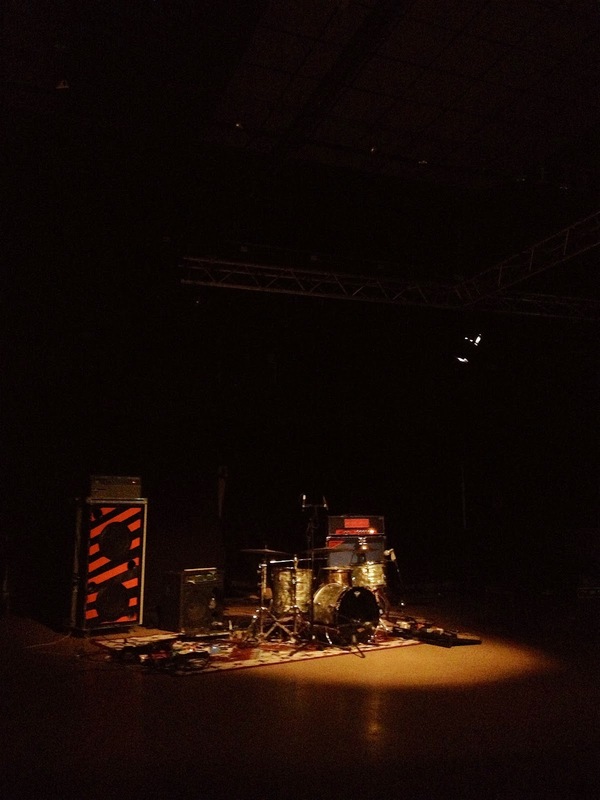 The bands guitarist and bassplayer build a massive stompboxlaced wall of dark noise. I have to come clear though on one point...when you have two musicians with a whammy pedal each and multiple Moogerfoogers you know that clean harmonies and sing-a-long choruses arent on the menu. They sound more like two tuned tanks trying to pocketpark in downtown Dhaka. Its a rivetting display of sounds and layers but not exactly hummable. But to my immense joy even though bass and drums lock occasionally the playing field is pretty much open for this truly remarkable drummer. His style is very loopy which I love. His drumming is based around a open doublestroke moved freely around the kit. I have never heard a drummer play in this manner before. The actual drumming technique is definitely not new, he uses a very simple basic foundaton of drumming but utilizes it in a refreshing and exciting way. As a bonus I can also tell you that it is very uncomfortable playing like this for extended time. Well atleast for me. but this added another dimension to the sound. From the first note to the last I stood there with a big stupid grin on my face. But I was there and I saw the light. And it came in the shape of an exceptionally talented Norwegian Drummer.